I was touched by the many comments following my blog about stopping teaching. People were surprised, sad, sympathetic and showing solidarity. I was surprised! I didn’t know anyone even read the blog! It made me realise how much I value this means of communication and what an important channel this is for artists like me working on their own in what is necessarily a solitary existence. Other people have mentioned it in emails and phone calls since then and I think I need to clarify one or two things. I’m stopping teaching classes and studio workshops but I intend to keep a presence on line and to post things on my two blogs. Reason being that I enjoy sharing my discoveries and I know there are people that benefit. And that is incentive enough. As I say in the intro to the blog…art is meaningless unless it’s shared. It’s the classes that take up the time with all the preparation, the thinking up and organising of projects, the gathering of materials, the booking up, the readying of the studio and so on. I’ve enjoyed it while it was happening but now time to move on. But I’m still going to be sharing on line, so the people who are following this blog and my other one, please keep with me. I value the fact that you’re there and listening! 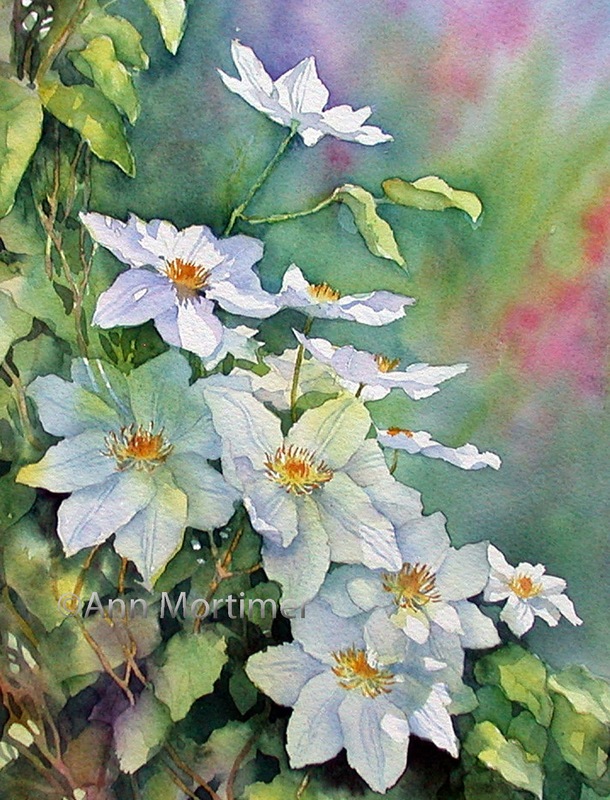 The image is of a painting I finished the other day of clematis growing early this summer on an arch in the garden. I LOVE your blog! You inspire me! I'm glad…thank you for visiting and commenting! I absolutely love your watercolour flower paintings. I have really enjoyed looked at your blog. When my children were little (they are 25 and 28 now) they adored the Tosca books (Tosca's Christmas and Tosca's Surprise) and I was wondering are you the same Ann Mortimer who illustrated those books? Thank you Mary. No I think you have in mind Anne Mortimer the “cat artist” and book illustrator. Anne with an “e”. Unfortunately for both of us, people do get us mixed up! Next Next post: Merry Christmas to all and a Happy New Year!